By The Chamberlain Group, Inc. Developer: The Chamberlain Group, Inc. 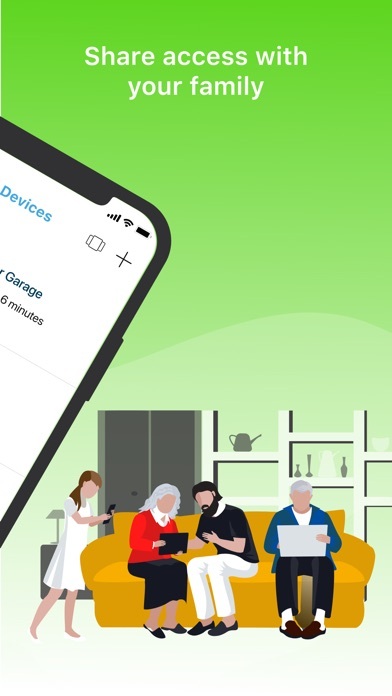 The myQ app allows you to easily open, close or check the status of your garage door, commercial door, gate or myQ home lighting from anywhere using your mobile device. 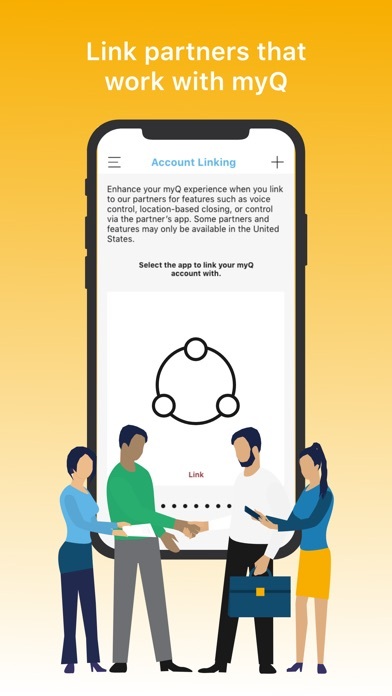 The myQ app supports myQ-enabled products from Chamberlain, LiftMaster. Additional Features: •	Set up alerts that notify you when there’s activity •	Set schedules to close your garage doors or gates or to have your lights turn on/off •	Grant access with Family Share For myQ smartphone control you need one of the following products: •	A Wi-Fi garage door opener enabled with myQ technology •	A myQ accessory to upgrade a non-Wi-Fi garage door opener To upgrade your existing opener with smartphone control, visit www.myQ.com for accessory options. All I wanted to know was that the garage door was closed by 9pm each night. It can’t do this!!!! I really enjoy the convenience of the automation. But I love the extra security from notifications when the door is operated. I updated my app to this one as suggested by support. This app has bugs. First sign is the opening graphic is jumbled up. Then the visual to let you know if your door is open or closed is the word open/closed. Before it was a graphic showing a door open or closed. Much better when doing a quick check at a traffic light. Then when I closed the door it said it could not close the door. A second latter it said closed for 3 minutes. It seems the design team went backwards! They need to make it where it can automatically open the door on a schedule too. Currently it will only auto close on a schedule. After updating to the newest app I’m getting a bunch of errors saying that there is a door closure error. I am actually home and looking at my garage door and it is open. Also getting network errors even though I was able to open and close the door with my app. Easy way to check the status of the garage door. Also, the smart phone app to town but the door is opening is extremely useful. Door open alert does not work. That’s a pretty key feature. Please fix this one guys. I don’t have another garage app to compare it to. But this one is very slow to connect and respond. The concept is great and the execution is almost as good. The only downside is occasional hiccups with the door sensor missing an operation and showing the door closed when open, and vice versa. That usually happened when the polar vortex outbreaks occurred this past winter and may simply be the result of battery charge lost t the cold. Chamberlain even sent me a replacement sensor. More recently, they sent me an email which said that their system identified that the door sensor battery needed to be replaced. That was the first notification about the battery that I received, so I hope that the problem is solved for the future. Common log in error issues and app speed prevents this from being a 5 star. When linked with Nest, it does not show the device name. It displays random letters and numbers. I am trying to get the family share option so I need to update the app. The app doesn’t update automatically and I can’t get the app to update. I have deleted it and reinstalled several times and it keeps coming back with the old version. Very frustrating. Since migrating to the new app, I no longer receive alerts the door is opened or closed. Why did it change from having one Big button to this tiny button? It needs to be changed!! PLEASE ADD GOOGLE ASSISTANT COMPATIBILITY. I use this app for a driveway gate and it works well to remotely open or close the gate. I was very excited about the scheduling feature and was thinking I could have it automatically open in the morning and close at night. Unfortunately it only allows you to schedule a time to close the gate (or door) and you cannot schedule it to automatically open. This seems crazy to me. Would also be really nice if you could program it to automatically close the gate (or door) after it has been open for a set period of time. Believe all the 1 star reviews- this new app is NOT ready for use - it is incredible buggy and basically does not work. The garage open/close notifications do not work correctly and forget about trying to pair it with your nest thermostats; it completely falls apart when you try to do that. I hope they are working hard to fix these issues but this version should have never been released to the public. This has worked great in the past. But after a day at work, I come home and it is no longer connected. Was able to get into the house and thought it was the router/modem, but it wasn’t. Did the run through a few times (blinking blue and green lights) and it won’t connect! Doesn’t always update right away as far as status of the door is. I love the notifications and the ability to close or open the door remotely. But, the functionality of the app needs work. If I go into the app and touch the garage door opener, it takes me into a re-naming screen and I can’t get back. I have to close out of the app and log back in and try again. Last app worked much better, there seems to be a lot of bugs in the new unified myQ app. This app would be perfect if they would just make the complication work on the Infograph Apple Watch 4 face. It works on other faces just not the one that I prefer to use. Not very good software needs to tell you more! 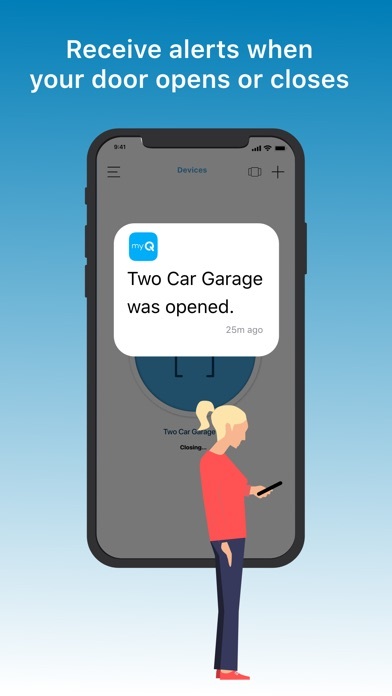 This new app is buggy and I can’t even close the garage door. You also get stuck on certain pages and there’s no way to go back. Not happy with this app update. Had 2 sensors originally connected to the unit. It worked fine for about a year. Now no matter how hard I try it will not allow me to set up the second door. Also, having to pay a monthly fee to use ifttt is quite ridiculous when everyone else includes the functionality for free. Finally, to add insult to injury, no Alexa support whatsoever. Don’t waste your time or money. This new version locks up if have more than one door and try to close them both. The first door closes, but the app locks up when you try and close the second. I’m having to force close the app and restart to close the second door. I’m going back to the old app, for as long as I can. PLEASE re-add IOS compliant notifications back in. The previous version let me choose banner notifications in IOS Notification Center, which I was also able to have sent to my Fitbit Blaze watch. So much more convenient to flip my wrist and see someone had opened or closed my garage etc. whatever you changed, this no longer works. Please fix! Not intuitive like the last app. I’ve had to delete and reinstall 3 times today after taking several hours to install a new hub so I could use the scheduler. It’s locked up again since I tried to edit alerts since I’m not getting close alerts. This is one of the most aggravating things I’ve dealt with in a while. Something that should just work, doesn’t. Consolidated a couple accounts into the new app. In order to do multiple functions I am finding I have to close out the app and restart it. It says the device is not responding, but it responded to perform the function I wanted it to, but the status did not update. 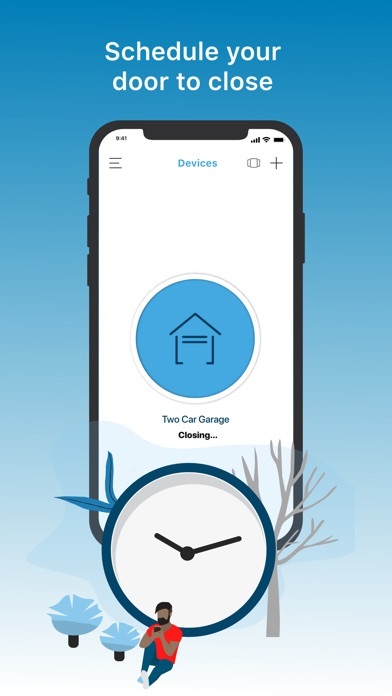 For instance, I closed the garage door, then the app says the device stopped responding and the door showed as still open, though it was closed. Then I closed the app and restarted it, and the status showed the door closed. Not a big deal, but annoying. By G E O R G E .
Doesn’t work without LED light which cost more $$$. MyQ is a SCAM. The old app worked fine. The improved it in a new app. It didn’t transfer the settings and I can’t get it to talk to the garage door opener. Great. Will not update! Terrible App! I like that I can look from work to see how long my garage has been closed. Sometimes I wonder if I closed the garage and I just check the app. This is the best thing ever for anyone who has an obsession with checking the garage door. So easy to load system up to our internet. Don’t have to circle back to see if we closed the garage door. Allows us to open door without giving out our password. This new one has an insane amount of delay and it won’t show an animation when the door is being closed or open. This leads to tapping on the door icon multiple of times and closing and opening the door multiple of times. I love that I can control my garage doors via my Apple Watch, but I am always presented with a screen that says “No Devices” while I am momentarily waiting for the WiFi to connect when I am outside ready to open or close one of my garage doors. If there were a delay at least 2 times as long before that notification appears, then the “No Devices” screen wouldn’t need to appear at all because the WiFi would be connected, and I could operate my doors. I am constantly having to dismiss the “No Devices” screen to get back to my list of doors to control them, since they have had sufficient time to connect to my WiFi. I would like to be able to skip the unnecessary extra step each time. If you want a garage button on your phone this is for you...if you purchased this lift master opener because it advertised it works with IFTTT as I did...let me tell you you will be disappointed. Only one action is available (close door) with an * below saying “close actions are not compatible” disappointing. Big features missing. 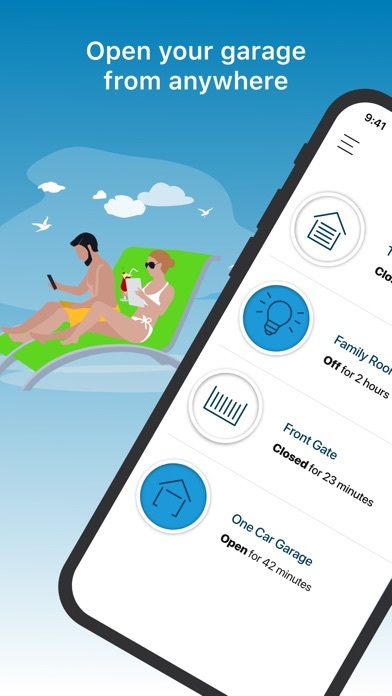 - Need to be able to have more than 3 guests - In open/close history it needs to be called out which user account with access open/closed a garage door - needs WEMO, LIFX and Hue integration to control things like outdoor lights when entering/exiting garage or light-based notifications in the home - fix the garage closing/opening animation. The illustration shifts around a few pixels. It's annoying and unprofessional looking.